Graduate-level teaching is a big part of Bob’s life in this season. Bob currently teaches for three graduate schools of theology: the Seattle School of Theology and Psychology, Regent College in Vancouver, BC and Westminster Theological Centre in the UK. Teaching for the Seattle School of Theology and Psychology involves weekly courses in Seattle (Mondays or Tuesdays) on Old Testament. 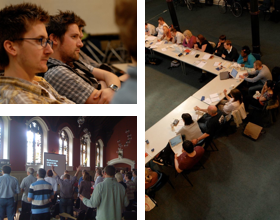 Westminster Theological Centre teaching commitments include teaching at two five-day residentials in the UK (late Sept and Feb) and weekly courses via Keynote with web-cam interaction to the UK hubs. Bob is a Sessional Lecturer at Regent College, teaching two Weekend School courses at the People’s Seminary in Burlington per year.